Several years ago our priest asked if we would help build a marriage ministry at our church. We were excited at the idea that God could use His triumph in our marriage to benefit other couples. As we read up on why marriages struggle we noticed that most couples struggled with resolving conflict; it was not only difficult for struggling marriages but also for generally happy marriages. We too had struggled with resolving conflict. So we set off to find a conflict resolution series that would benefit couples at all stages of marriage. As we searched, we noticed that most approaches to resolving conflict were missing three key components: 1) being routed in God as the 3rd person in marriage, 2) a focus on sacrificial love instead of compromise and 3) a practical approach, steps to follow, to actually help resolve conflict. We found several approaches that focused on compromise and processes to do so, or theoretical themes to improve communication, or exercises to grow closer to each other. All of which we not only found lacking in the three key components we were looking for but none of these approaches were helpful for us when we needed serious help to resolve conflict better. Don’t get me wrong, there are a lot of great marriage books out there (some of which I will recommend and will review in future posts), but none of them, that we found, helped us become better at resolving conflict. For years our communication style was fighting and arguing. Conflict was our middle name. Both of us are first-born, strong Type-A personalities who are used to being right and used to getting our way. So attempting to resolve conflict, without being intentional about our approach, was a recipe for disaster. Our natural inclinations led us to fight more, resent more and trust less. Along the way, we participated in hundreds of counseling hours, sought counsel from married couples we admired, met with our priest and prayed A LOT! Eventually we learned how to communicate and resolve conflict in a way that respected each other, brought us closer together, and actually solved problems without the typical compromise approach. The method I will be sharing with you over the next several posts is a summary of what we have learned, all delivered in a package titled RESOLVING CONFLICT WITH P.R.A.Y. Marriage is a union between 3 persons (husband, wife, and most importantly GOD), so including God when resolving conflict is imperative. This approach to resolving conflict is rooted in prayer and a focus on being self-less as Christ has called us to be. Our hope and prayer is that you might find the Holy Spirit working through your marriage as you practice RESOLVING CONFLICT WITH P.R.A.Y. when resolving conflict in your marriage. Resolving Conflict with P.R.A.Y. is a 4-step process using the word PRAY as our guide. P – Part Ways – TIME OUT. Once a conflict or disagreement has been identified, take a time out from each other. R – Reconnect with your spouse. This is the time to understand your spouse’s feelings and concerns. It is also an opportunity for your spouse to do the same for you. This is a time to listen!! This is NOT a time to solve the problem (that will be later). A – Apologize for hurt feelings or wrong doings. This is the time to apologize for anything you have done to create the conflict, misunderstanding, or hurt feelings. No, this is still not the time to solve the problem, and it is definitely not the time to point fingers at your spouse and your perception of their wrongdoing or contribution to the issue. Y – Yes Me – Yes, it is me that needs to make an effort. This is the time where you volunteer what you can do to improve the situation. You look at what you learned in R or Reconnect, you draw on empathy and concern, and you step up to do more for your spouse in this situation. What you can do might be big or it might be small, but it is important that it is a genuine effort to be selfless and empathetic to your spouse and their feelings. This is where the problem gets solved. We will dig deeper into each of these 4 steps, but hopefully the tid-bits mentioned above will give you an overview of what the process looks like. Please do not get discouraged because you do not see a place to point fingers at your spouse’s wrong doing. This process works but it will be different then any process you have tried before or seen on paper. This process focuses on how we can be a better Servant Spouse and be more selfless instead of self-focused. It does not mean you will not get your needs met, it just means we will go about it in a new way. A way focused on meeting your spouse’s needs first. I mentioned in my previous post Giving 110% to Our Marriage that I believed the word compromise to be a 4-letter word. In some circumstances and some marriages, compromise might be a workable solution. I am sure there are several successful marriages that would say the key to their successful marriage is compromise. Our experience has been different. Compromise in our marriage created division and resentment. Statistics say that at least 50% of all marriages end in divorce. My hypothesis is that of the 50% of marriages that succeed most of them succeed utilizing compromise. And the 50% that fail, compromise was most likely unsuccessful or not enough. I do believe that the 50% that would typically fail need sacrifice instead of compromise to save their marriage. For these couples, sacrifice (being self-giving) is the key that unlocks the hidden potential in their marriage. Our marriage is one of the marriages that would have failed had we not discovered sacrifice as the key to saving our marriage. Regardless of which 50% bucket your marriage might fall into, I would also hypothesize that learning to be sacrificial and self-giving will elevate your marriage to a level of happiness only God can provide. Either way, learning this approach can only benefit you! Before we can tackle the 4-step process, we need to look at some basic communication dos and don’ts. 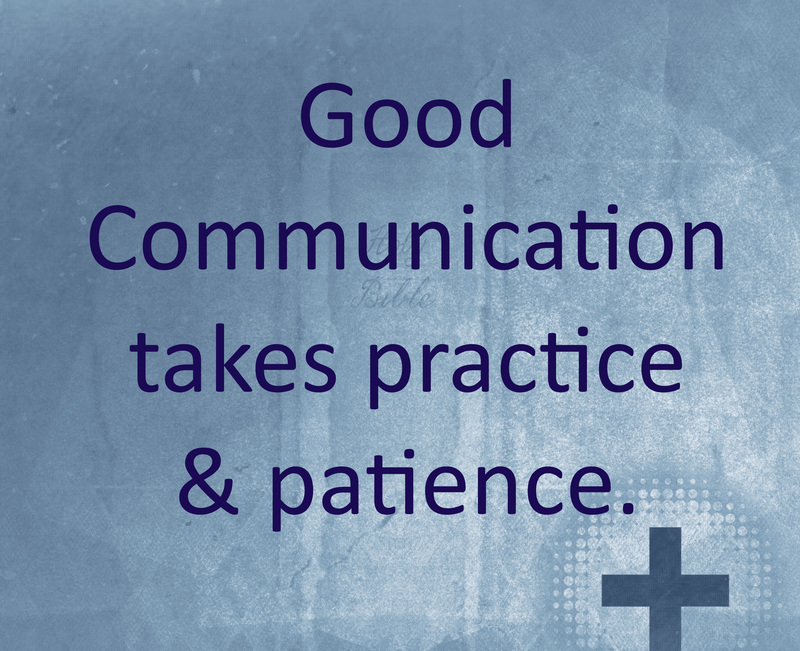 Communication is vital to good conflict resolution and to the success of marriage. When our communication is failing we wound each other, feelings are hurt, families are broken, and God is not honored. When our communication is working we build each other up, feelings are understood and respected, families are strong and impactful, and God is honored. I believe all of us desire to have good communication with our spouse but we do not always know how to accomplish it or we think we are good communicators but the evidence says otherwise. We know our communication needs some work when we see behaviors that create resentment and disrespect instead of love and trust. For me, I used to think that my success at communication in business was evidence that I was a good marital communicator. So, if we were struggling at home with our communication, I would blame my husband, because “I have good communication skills!” Boy was I WRONG!!!! 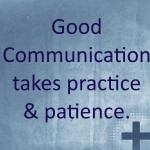 Being a good communicator in business or other worldly things does not help us be good marital communicators. Our marriage is a covenant and needs to be treated differently. Our marriage is a mirror of the relationship between Jesus and His Church. So, if you are thinking like I was, you might also be thinking that learning this new approach is a waste of time. I promise, if you want to strengthen your marriage, this will not be a waste of time. Have an open mind and try to put aside your “business” mentality. Take off your business hat and put on your Jesus hat (your Servant Spouse hat)! NO Lying/Exaggerating/Withholding – The truth is the only place to start and finish. If you have developed a habit of withholding to spare a fight or telling a little white lie to your spouse here and there to avoid judgment you will want to turn over a new leaf. NO Disrespect – Respecting our spouse is an important marital foundation. Lack of respect results in degrading of the other, name-calling, or treating our spouse like a child. NO Lecturing/attacking – Lecturing is where we get on our soapbox and “talk at” our spouse. Attacking is where we lecture and blame all at the same time. Not Making Time – Have you ever disagreed with your spouse about a topic, but not taken the time to discuss it because it seemed trivial or unimportant to you? It is these situations you will need to start looking at differently. Instead of measuring their importance with your measuring stick you will want to choose to label them important because your spouse says they are. This means making time for them. NO using the word “JUST” – We use the word “JUST” more than one might think. “If you would just pick up after yourself.” Or “If you would just take out the trash.” Or “If you would just have dinner ready when I get home.” Or “If you would just do something besides read your book all day.” The list could go on and on. No matter how you might end this sentence, most likely it is a criticism or a complaint. When we use this word, we are deciding our spouse’s priorities for them. We are ignoring our spouse’s unspoken to-do list or priorities, usually without taking the time to understand what is currently important to them. Most likely unintentional, the use of the word “JUST” is disrespectful, unloving, and presumptuous. So, look at “JUST” like it is a 4-letter word, and do your best to avoid using it. All 6 of these behaviors tear down our marital communication. Not doing them helps build good communication and sets us up to resolve conflict more successfully. Don’t be overwhelmed if you find yourself being guilty of several of these communication no-nos. It will take practice and patience, but you can turn them all around. At one point I was guilty of all of them. If I can turn them around, I believe you can to! Review the list of General Communication No-No’s. Identify which of these you currently do. Set a goal to focus on eliminating one of them from your marital communication this week. Next week set a goal for the next one, etc. Avoid the temptation to notify your spouse of the communication no-no’s that they are guilty of. Do not take it upon yourself to do the activity for them, and please do not demand they do it at all. Feel free to share this post with them and pray that they might feel motivated to participate in the suggested action. Focus on yourself and how you can improve. Prayer for Your Spouse by Melissa B.
Heavenly Father, in the beginning, you yourself instituted the sacrament of marriage. Bless _________ in her/his role as my wife/husband. Grant her/him the grace to persevere in love for me. Help me to be the support she/he needs today and always, so that she/he may see Heaven. May my eyes see her/him as you see her/him and may I look past her/his failings to see her/him as your child and my life partner? May we as a married couple choose you as the foundation of our marital love, and may you strengthen our marriage to withstand all types of suffering. Grant that I may die of myself and trust in your divine plan for our marriage. Help us to be truly one, as you designed. This I pray, in your Holy and Precious name. Amen. This entry was posted in Being A Servant Spouse, Resolving Conflict. Bookmark the permalink.